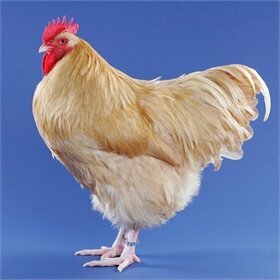 Orpingtons are big, friendly dual-purpose birds originally developed in the UK. 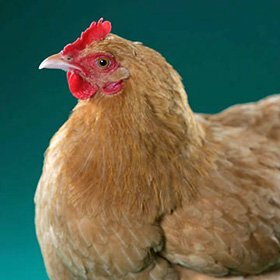 For many small farms and homesteaders, Orpingtons are the only way to go! They're cold-hardy due to their fluffy plumage. Wonderful mothers, they do go broody. There is not much more charming than seeing a mother Orpington and her fluffy new baby chicks peeking from beneath her wings in a field of clover on a sunny day. Plus, they're gentle and friendly on top of being good layers. 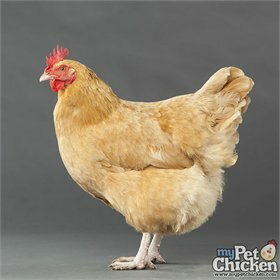 The Buff Orpington is the most popular of all varieties of Orpington--a pretty, bright, pale "buffed" copper color that is striking as eye candy on a green lawn.